This event always marks the beginning of an exciting time for myself and so many others as we participate and anticipate complete room transformations. From beginning to end, the weeks pass, progress is made and excitement builds. This round will complete my fifth season of the “One Room Challenge”. So many other talented people are also participating as guests, please check out their spaces HERE. It was a tough decision for me in deciding what space I want to renovate or re-renovate as the case may be 😁 You see, there are still spaces and rooms that have not been touched since we moved into our french country home. There are also spaces and rooms that have gone through a renovation or partial renovation and need to be looked at again. Some rooms in our home will require a large investment to bring them up to suitable standards and others will require a smaller investment, basically a few adjustments to give it a new look. 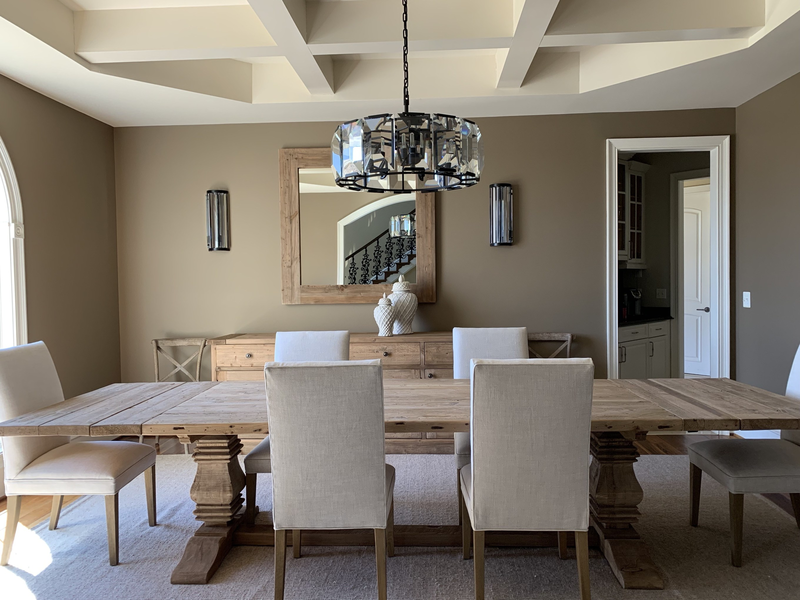 So for this round of the One Room Challenge, I am choosing a room that went through a remodel a few years ago but it still needs a bit of tweaking, and that room is our dining room. My main goal is to lighten up the space, mainly the walls and ceiling. I feel the room needs more texture as well. I also want to add more detail to the coffered ceiling we built years ago. I’m looking forward to changing the look of this room, without breaking the bank. A few tweaks can give the room a whole new look and feel. There are so many things I love about each of these inspiration photos. I have a fairly good idea of how I want the room to feel and function when it’s complete and hope my “vision” of our room will look as good as it does in my head. Stay tuned and check back next week for updates! Hi Mel, I’m excited to get started. My new rug arrived yesterday and I’m picking our paint colors. Thanks for following along. Home Renovation always gets me excited 😁 I love seeing progress!! I hope it turns out as well as I think it will 🙂 Missed you!! You’re at it again! I love when you do these renovations. They’re always very exciting to watch. Good luck and I can’t wait to see the final project! Thanks, Me too 😉 I have a vision in my mind, hope it looks just as good in reality!